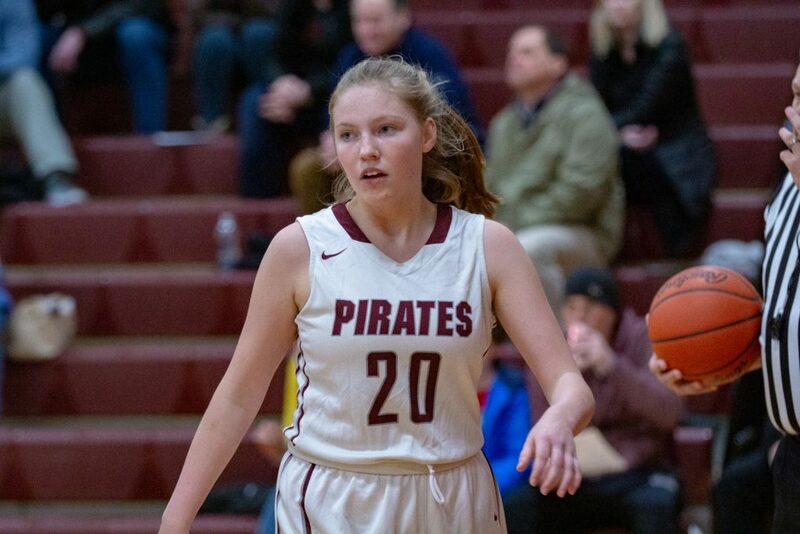 ROCKY RIVER, Ohio – The Pirates registered their best shooting performance in nearly a month, as Rocky River downed Valley Forge, 50-37, in a Great Lakes Conference battle on Friday night. Rocky River (7-12, 5-6 GLC) shot 36.2 percent (21-of-58) from the floor – includi ng a 6-of-14 (42.9 percent) performance from 3-point distance – in snapping a three-game losing skid. The accuracy figure marked River’s best since Jan. 12; the 50 points marked the Pirates’ second-most in a single game this season. Senior guard Nani Meese was dialed in from distance, leading River in scoring on the strength of five buckets from beyond the arc. Meese finished with 20 points, tying her season-high (Dec. 22 vs. Cloverleaf). The veteran guard drained three treys in an opening half that saw the Pirates bludgeon the Patriots, 27-10. The visiting five rallied with a nice run early in the third quarter, but a brilliant 10-2 Pirate surge over the back half of the period helped River retain its significant advantage on the Rocky River Gymnasium scoreboard. That surge was highlighted by two Meese triples and a Kelsey Murphy bucket off a nifty feed from Grace Harte. Bench depth was on display in the fourth frame, as the Pirates closed out a season sweep of the Patriots (River beat Valley Forge, 50-32, on Dec. 5). Valley Forge shot 26.3 percent (15-of-57) from the field, while out-rebounding River, 32-27. 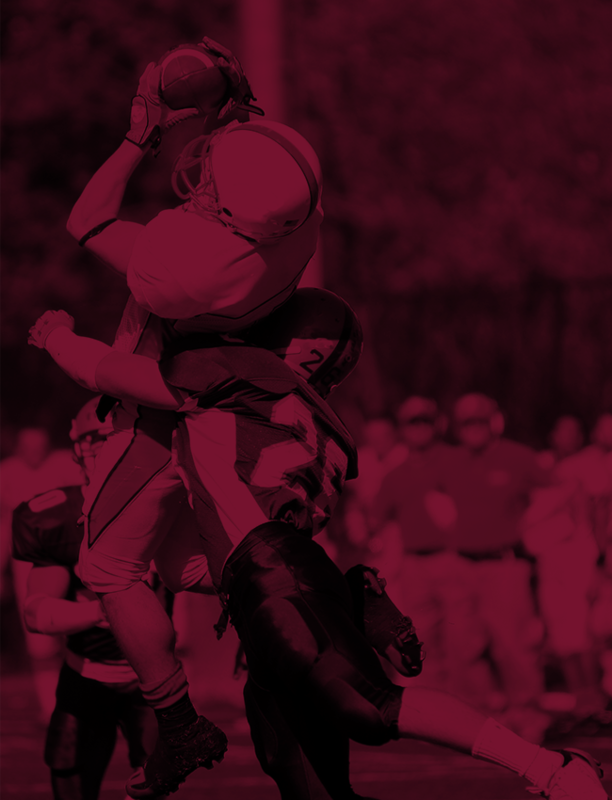 A ball-hawking Pirate defense forced 19 turnovers in the contest (River finished the game at plus-6 in turnover margin). Meese added five boards to her 20-point night. Maria Potts finished the game with 10 points and three steals. Julia Potts logged eight points and four assists. Murphy logged her 11th double-digit rebounding performance of the season, hauling down 10 against a strong-rebounding Patriot team. Friday’s game marked the front half of a weekend double for the Pirates, who will play at Lutheran West on Saturday. River’s 5:30 p.m. game against the Longhorns will mark the opener of a girls’-boys’ basketball doubleheader between the Pirates and their neighbors to the south. 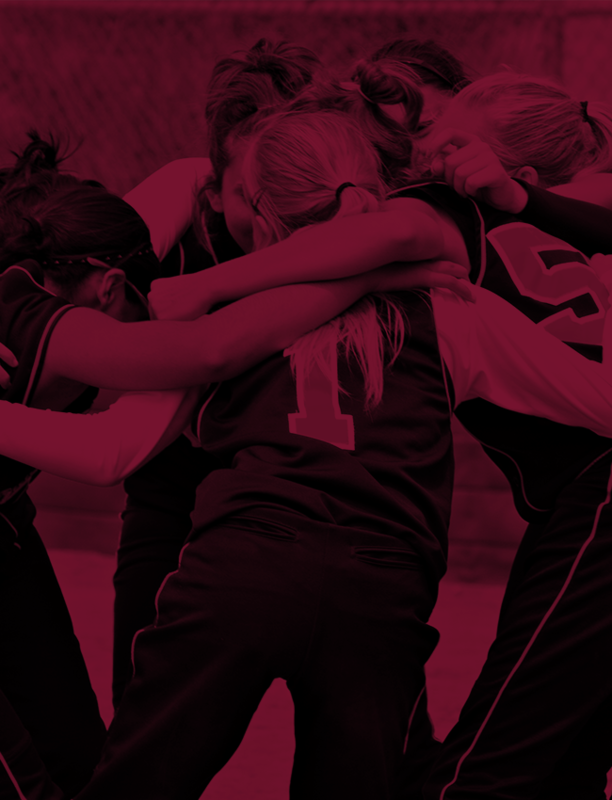 THRICE IS NICE: River’s varsity win closed out a winning tripleheader on Friday. In freshman action, the Pirates rode 12 points from Estella Giomini and seven from Lauren Snow to a 30-17 victory. 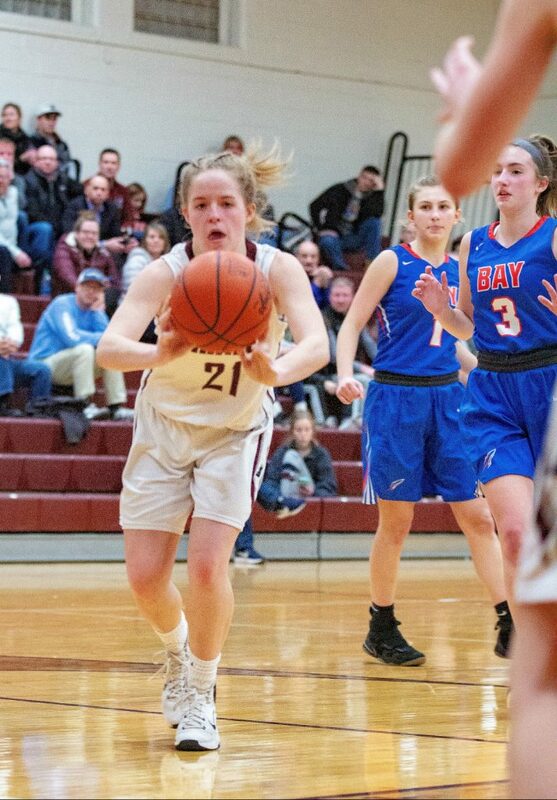 In Friday’s JV game, Rocky River rallied from a late 14-point deficit to force overtime on a Giomini three at the buzzer. The Pirates would go on to win the hard-fought game, 30-28. Freshman Mila Ricketti, who blocked a Valley Forge shot with 16 seconds remaining in regulation, finished the game with 14 points. LONG-DISTANCE INFORMATION: Rocky River six 3-pointers Friday tied a season-high (Dec. 5, Jan. 16). River went into the game shooting 23 percent (51-of-223) from distance. The team’s 43-percent mark on Friday tied a season-high (Dec. 5). Nani Meese hit three triples in that game, a road win at Valley Forge.